1. Go to Grandma's House. 2. Have Grandma come to our house. 3. Go to a restaurant with Grandma. My mom reading to my daughter a few years ago. 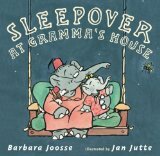 Another proud Grandma is Barbara Joosse, author of over 30 books including the beloved Mama, Do You Love Me? . 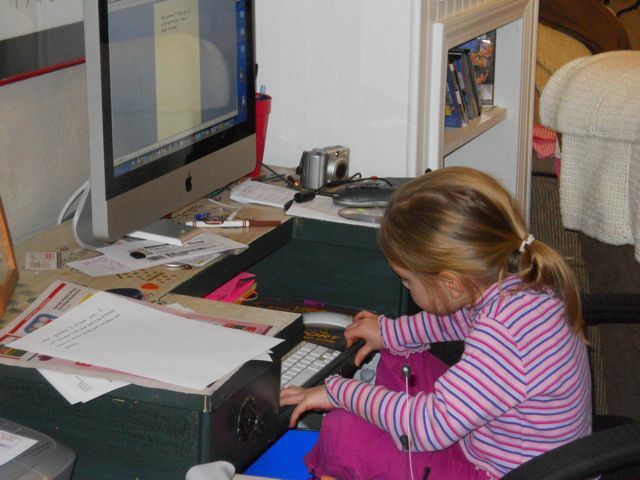 Her website exudes her love of being a Grandma to her two granddaughters. She says, "I'm in charge of FUN. We love puppets and reading and singing and dancing and cooking. We also love each other." I told my mom after she read my daughter Joosse's Please Is a Good Word to Say , "The author of that book loves being a grandmother." She replied, "There is nothing better." my nighty in my nighty trunk. and everything in the regular place. goodbye you baby in the bed. I this idea interests you - I found another article from School Library Journal discussing this topic in more depth with Barbara Joosse. I wanted to do something special for the Grandmas. 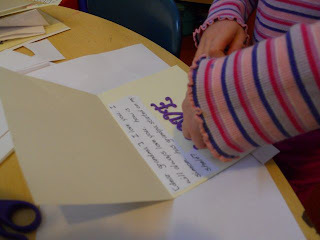 My children love receiving cards in the mail from them. We just got Valentine cards full of stickers and sweet messages. I thought it was our turn to reciprocate. We made handmade cards for our Grandmas (and my son chose to send one to his great-grandpa, aka Grandpa #3 - he always has his own plan!). 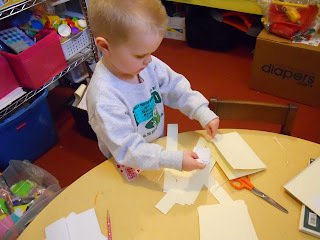 We pulled out the scissors, markers, and stickers to design our cards. My son chose to send a note (typed gibberish on the computer) along with his card to his Great Grandpa. My daughter wanted to type her notes to her Grandmas on the computer. She pasted the typed message then added stickers and letters. They addressed their own envelopes (my son placed a label), attached a stamp, and placed in the mailbox. I was thinking about one other thing about Grandmas. When my mom became a Grandma for the first time she couldn't wait to find out what she would be called. She ended up being called "Grandma". My kids call their other grandma, "Gammy". Post a comment to share what you call your Grandma or what your kids call their Grandmas. I think it would be cool to hear all the different names. That's one thing I unfortunately missed out on as a child...grandparents. My mother's passed away before I was born as did my father's so no extended family here. Still, I love resding books like these and sharing in the ever present joy and laughter that they inevitbly hold. Thanks for sharing!